We live in a world where pretty much everything we could want is available at our fingertips. There's a grocery store on every corner, box stores full of disposable fashion, makeup and beauty products, in every quadrant of the city. In fact, you don't even have to leave the comfort of your home, as everything is available online with a few clicks and a credit card. What I've started to notice about this conveniency is that it can result in a lot of mindless purchases, choosing the product off the shelf that has the best advertising, best price, best smell, or it's the only one available. This in turn creates overflowing toiletry drawers, crammed junk drawers and the feeling of needing to declutter way too often. Then Emmy was born. And I was reminded again of the fact that I'm not just responsible for myself, but I'm also responsible for two tiny humans. A new baby, with brand new skin, really made me reevaluate the products I was purchasing: were the "natural" products actually natural? Were the ingredients listed ones I was comfortable slathering all over their precious skin? Was that cartoon character, "hypoallergenic and gentle" bubble bath safe? Could I do better? And then I started thinking...why am I only concerned about what I'm putting on my children's skin? Why am I not questioning the products in my bathroom? Recently, as my 34th birthday approached, I started to reevaluate the kind of life I wanted to live and the kind of life I wanted to model for my impressionable children. I used to pride myself in cooking healthful, clean meals, avoiding processed snacks, questioning the beauty products I was putting onto my body, cleaning with nontoxic cleaners, and purchasing quality items over quantity. But somewhere in the past year or so, I have lost my way. I am far from perfect, and with a toddler and a baby at home, my home is also far from perfect. I am not a minimalist, nor will I ever be one, but I do desire simplicity where I can find it, and luxury where I can afford it. Around this time, I started to notice Beautycounter products popping up on my social media, and then also around this time, I happened to connect with a woman on Instagram who was already involved with Beautycounter. Dawn ever so gently provided me with some information on the company while also giving me some samples of their products. After doing a lot of research and trying some of the products, I was not only hooked, I was inspired. You see, Beautycounter is more than just a line of luxurious and toxin-free beauty products. It's a lifestyle. It's a movement. It's an opportunity to change the beauty product market. The more research I did, and the more I educated myself about the products I was currently using (some that I assumed were safe because of good marketing), the more horrified I became. There are currently more than 80,000 chemicals on the market today, and only 500 of them have been prohibited for use in the cosmetic industry in Canada. The US has only banned 30 to date, but the EU is far ahead of the game, with more than 1300 chemicals banned in personal care products. Beautycounter is a company devoted to progress. 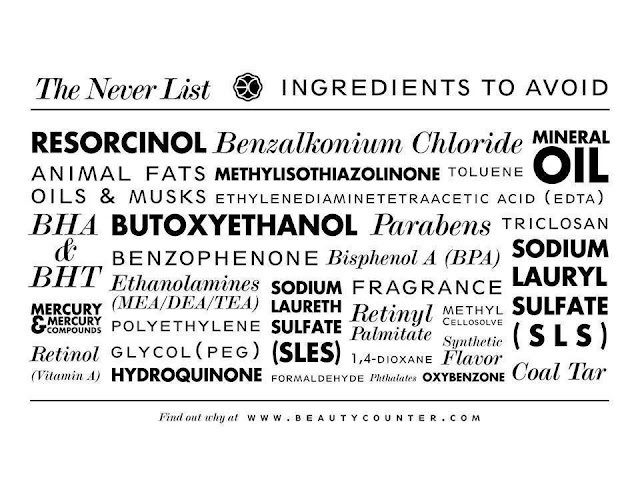 They have created a Never List - a list that includes over 1500 questionable or harmful ingredients that they will never use in their products. Beautycounter wants to make the world a healthier and safer place, and so do I. To me, it's more than just purchasing their products. It's about educating yourself and the loved ones around you. 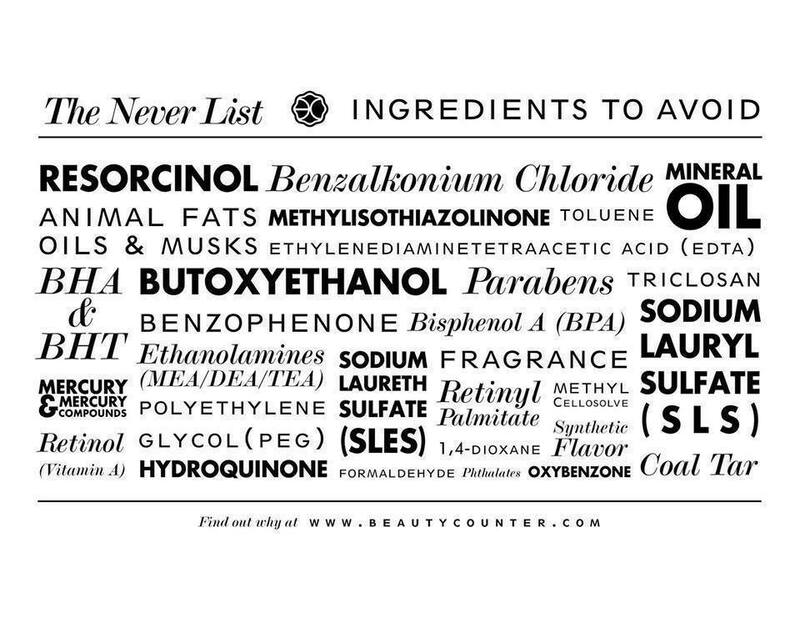 Start reading the labels on your beauty products, familiarize yourself with some of the big no-no ingredients (BHA, BHT, EDTA, Parabens - methyl-, isobutyl-, propyl- etc., Phthalates, Retinol - vitamin A, SLS & SLES, Fragrance - a term that can include any combination of up to 3000+ chemical ingredients) just to name a few. Our skin is our largest organ. How can we care about what we eat, about how often we workout, ensure we take our vitamins, if we're just going to slather chemicals all over our bodies? It takes less than 30 seconds for our bodies to absorb the chemicals in our beauty products into our blood streams. I cannot help but think about the impact this has to be having on our bodies. Don't we deserve better? Don't you deserve better? Don't our children deserve better? If I can care about what I'm putting on my children's skin, I should care about what I'm putting on my skin. So, if you're still reading this, to make a long story short, I joined Beautycounter as a consultant because I want to be part of the change and I want to share it with everyone I know and love. Do I think you need to own every single product of theirs? Of course not. There is plenty of room to continue to support the small, local shops that are also contributing to this movement by making safe, and clean beauty products. My wish is to educate, to get my friends and family reading the labels on their beauty products just as much as the labels on their food. To vote with their dollars by making better choices as we move forward. To be more mindful in what we not only put in our bodies, but by what we put on it. To choose safe, quality beauty products over quantity. Beautycounter has become a part of my daily life now, so you will see it pop up here and there. If you want to learn more, I would love to talk with you. Send me an email, or find me on Instagram. But most of all, I want you to remember that your body is worth it.